Apple’s sophisticated devices give you a wide range of functions that you may not know in depth. 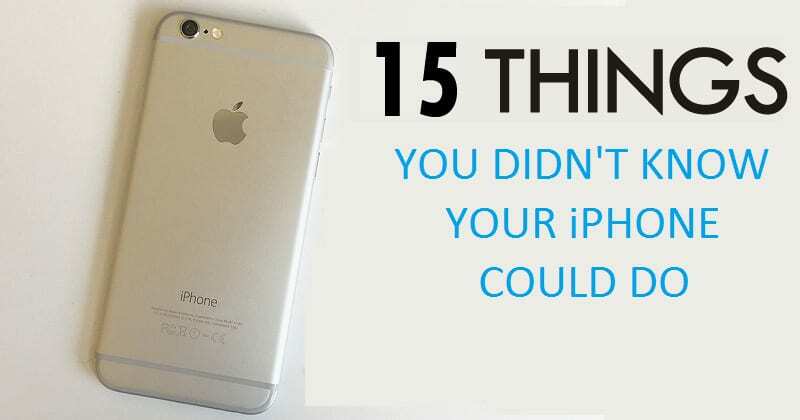 So, for iPhone users, today we bring a collection of 15 things you probably did not know your iPhone could do, and that will be a great help to optimize your time and improve the use you make of this essential device in your daily life. If you are an Apple enthusiast and still think you can squeeze the use you give your iPhone, we have a few solutions for your control. In fact, we do not usually take full advantage of the immense potential of our gadgets, whose tricks, shortcuts and functionalities can significantly contribute to improving the comfort of our day to day usage. For iPhone users, today we bring a collection of 15 things you probably did not know your iPhone could do, and that will be a great help to optimize your time and improve the use you make of this essential device in your daily life. To open mouth, we remember one of the best tricks, which is none other than the one that allows you to free space in the memory of the iPhone without erasing anything. Shake your iPhone to undo the text: Did you make a mistake while editing an image? Do not worry, shake the phone and the option to delete the last action will appear. Charge the battery more quickly using airplane mode: One of the main advantages of using this method is the deactivation of the wireless network, which allows your mobile to charge almost twice as fast. Get Siri to read your emails aloud: Apple’s efficient assistant can provide you with a wide range of help. If you say “read my mail,” Siri will tell you all your messages aloud, although you can segment your proposal by the most recent or with the specific name of a contact. As a curiosity, you can find out how many planes are above you: If you ask Siri how many flights are on me, you will see a list of the active flights in your area that are flying over you at the moment. You can teach Siri to improve his pronunciation: If the assistant does something improperly, you can say “no way” and offer you different alternatives to choose from. You can turn off the music automatically with your timer: Many of us like to sleep listening to songs, but we do not want it to keep ringing all night long. In the timer function, select the “On completion” option and then “Stop playback.” Thus, depending on the time span you choose, the music will be turned off. Play music and videos in the middle, fourth, or eighth of average speed: Usually, we listen to videos at high speed, and it is difficult to find an exact second. However, if you hold the dot on the top bar of the player and move your finger down without lifting it, you can control the playback speed. Take pictures using the volume buttons: If you find it uncomfortable to take snapshots with the center button, you can simply press the volume up and down button to perform this action. Take a series of photos simultaneously: If you hold the take photos button, your iPhone will capture a series of quick shots sequentially. This is particularly useful if you want to capture the image of a moving object. You can see the exact time of sending your messages: Dragging the message to the left, you can see the time of sending all text messages. Take Screenshot without any app: Well, you don’t need to have any other app just for taking screenshots. Just hold the home button and the on/off button at the same time. It will take the screenshot. Change Siri’s Gender: You might not believe, but you can actually change Siri’s Gender. Simply, go through the Settings > General > Siri and then find ‘Voice Gender’ and then set ‘Male’. Now Siri will get a male voice. Create Passcode with letters: Do you feel that numbers are not enough to safeguard your iPhone? Well, you can actually go through the Settings > General > Passcode Lock and then turn off the ‘Simple Passcode’ to enable letters. This feature will enable full keyboard which you can use to create passcode with letters instead of numbers. More Detailed Calendar: This is another trick which iPhone hides from users. You can actually get a detailed calendar in your iPhone just by turning your phone sideways. You will see the more detailed calendar. So, what do you think about these options? Simply share your views and thoughts in the comment section below.